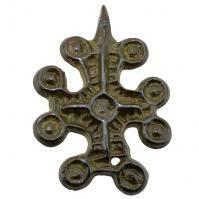 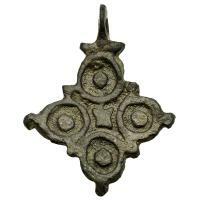 Byzantine Empire 8th-11th century, bronze cross pendant. 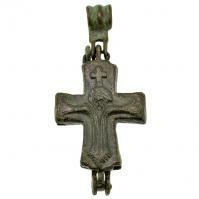 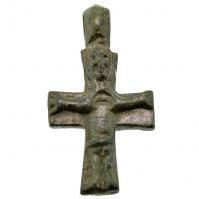 Byzantine Empire 8th-11th century, Jesus Christ & Mary bronze cross pendant. 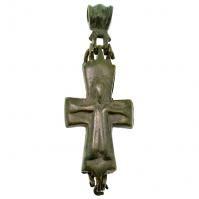 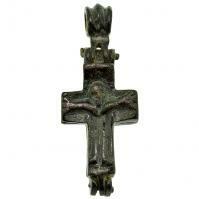 Byzantine Empire 8th-11th century, Jesus & Virgin Mary Enkolpion bronze cross pendant. 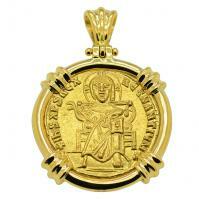 Byzantine 969–976, bronze follis in 14k gold pendant. 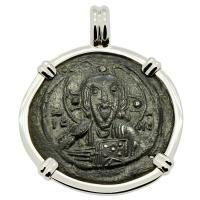 Byzantine 976-1025, bronze follis in 14k white gold pendant. 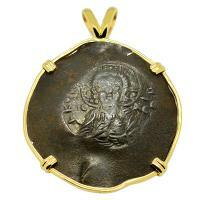 Byzantine 1028–1034, bronze follis in 14k gold pendant. 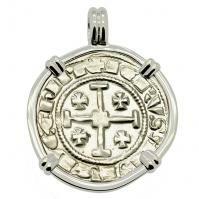 Byzantine 1078-1081, bronze follis in 14k white gold pendant. 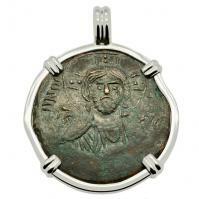 Byzantine 1078–1081, bronze follis in 14k white gold pendant. 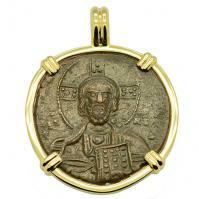 Byzantine AD 1068–1071, bronze follis in 14k gold pendant. 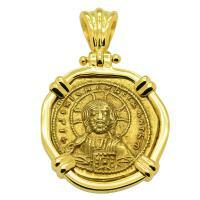 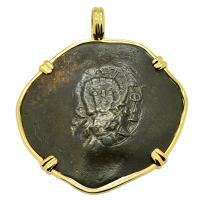 Byzantine 867-879, Jesus Christ with Basil I & Constantine Solidus in 18k gold pendant. 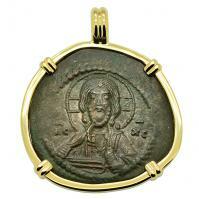 Byzantine 945-959, Jesus Christ with Constantine VII & Romanus II Solidus in 18k gold pendant with diamonds. 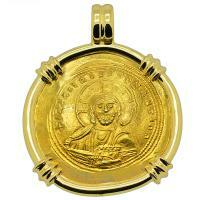 Byzantine 963-969, Jesus Christ with Virgin Mary & Nicephorus II in 18k gold pendant. 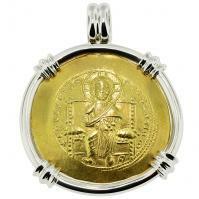 Byzantine 1042-1055, Jesus Christ & Constantine IX Tetarteron in 18k gold pendant. 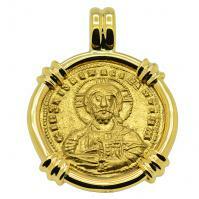 Byzantine AD 1042-1055, Jesus Christ & Constantine IX gold nomisma in 18k gold pendant. 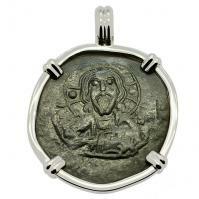 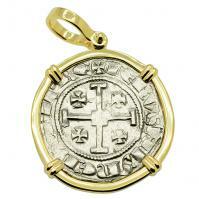 Byzantine AD 1059-1067, Jesus Christ & Constantine X gold nomisma in 14k white gold pendant. 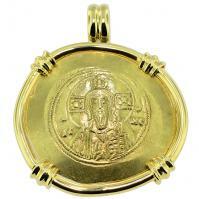 Byzantine AD 1071-1078, Jesus Christ & Michael VII gold nomisma in 14k gold pendant. 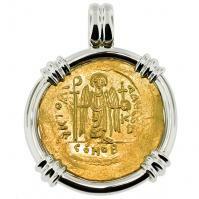 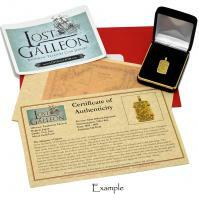 Byzantine AD 582-602, Angel & Emperor Tiberius gold solidus in 14k white gold pendant. 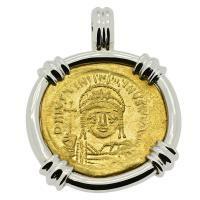 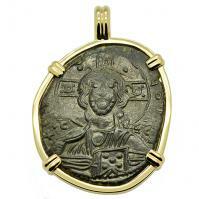 Byzantine AD 545-565, Justinian the Great gold solidus in 14k white gold pendant. 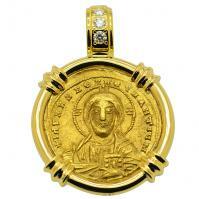 Byzantine 1195 – 1203, Christ aspron trachy in 14k gold pendant.